Mario, one of the best game everyone played in their childhood. It is an amazingly fast game which was popular in all ages of that era. If you still want to paly that game, you can play it on your pc. Yes ! this game evolved again by the developers to run it on your computer. Unlike old tricks you dont need any kind of emulator, even dont need to install. It is portable .exe file of just 6 MB is size. It supports all the major operating system Windows, Mac & Linux. 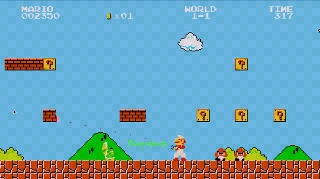 - Total recreation of Super Mario Brothers . Portal Gun, is a new feature in which mario has a portal gun to kill enemies. Although gameplay is excellent and smooth. For graphics you need to customize game graphic settings and emulate pixel shaders to get an epic looks like old tv gameplay. Unlike conventional tv games, you can customize your game character. There are many new other options you can explore. So, what are you waiting for , just download it from the link below and enjoy !!! !